There are never enough opportunities to explore Chinese subjects here so I welcome this one. 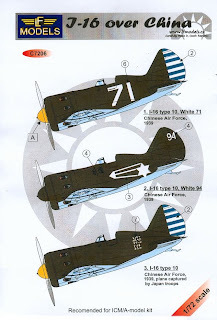 LF Models have recently released a decal sheet for the 'I-16 Over China', the Polikarpov I-16 Type 10 'Rata' in Chinese Air Force service intended for the 1/72nd ICM or A Model (and here) kits. As far as I know ICM do not yet produce a Type 10 Rata and the A Models kits are the Type 5/6. The second subject on the sheet, identified only as 'White 94' of the Chinese Air Force, has been illustrated in various publications with the fuselage insignia sometimes described as a "comet" and presumed to be a unit or personal marking. The aircraft is in fact one of two supplied to the province of Xinjiang (Sinkiang) by the Soviet Union for the air force of the warlord Sheng Shicai. LF Models decals are very fragile and the colour print can be scratched off during handling. This vulnerability is not helped by the provision in the set of an odd little lump of grey resin, which I take to be a seat parachute (but I could be wrong about this). The damage to the rudder stripes caused by the resin in transit may be seen in the scan above. Xinjiang (or Sinkiang) was the Chinese province through which most Soviet aid to Chiang Kai-shek's Republic was received and in 1937 the warlord Sheng Shicai (Chin Shu-jen in some accounts) created a small independent air force with Soviet help. The close ties between Sheng and the Soviet Union encouraged the Chinese Communist Party (CCP) to view Xinjiang as a sympathetic and secure haven. In May, 1937 they established a military academy called New Camp in the capitol Dihua. This was expanded to include aviation training and in March 1938 twenty-five communist cadets were enrolled for flight training and eighteen for ground support studies on U-2 and R-5 types. The students wore Nationalist uniforms and their CCP affiliations were deliberately hidden. The aviation programme was suspended in 1940 because Sheng was unable to secure further deliveries of arms and equipment from the Soviet Union, but re-opened in early 1941 when he received six I-15 and two I-16 fighters. By April 1942 the nascent communist pilots had achieved an average of 300 hours on these two types and were combat capable in the I-16. These were the very first CCP pilots and the I-16 depicted by LF Models is therefore of particular historical significance. Politburo member Chen Yun, who had been responsible for the idea behind the aviation training, had declared that the Xinjiang Aviation Unit would be "the first group of red pilots and the initial core members of a red air force". In the summer of 1942 Sheng allied himself more closely with Chiang and purged the New Camp academy, arresting 160 CCP personnel including the pilots and groundcrew of the Xinjiang Aviation Unit. The fuselage marking on 'White 94' probably derives from the Xinjiang flag used by Sheng Shicai, originally a red six-point star on a yellow field but later changed to a yellow six-pointed star on a red field. Rather than white as depicted in most profiles and the decals the star was possibly red or more probably yellow, as indicated by one of the photographs above. The aircraft were photographed at a ceremony handing them over to Chiang Kai-shek's Kuomintang (Nationalist) government and I suspect that the areas between the white lines, rather than just revealing the dark green camouflage, may have been painted red and blue to reflect the Kuomintang flag and to symbolise the handover. The Xinjiang star was depicted literally "bowing" towards the Kuomintang flags draped on the noses of the aircraft. Whether before the handover the aircraft carried a red or yellow Xinjiang star is six positions as with the U-2 and R-5 is unknown. The black characters on the side of the aircraft read "Xinjiang". Note also the differences apparent from the photographs to the way the marking has been depicted in previous profiles and decals, including LF Models' sheet. The star is angled and the radiating lines are set equidistantly and perfectly parallel to each other from each of the three points of the star. They are not asymetric as drawn in the profiles and decals. The number of I-16 used by Xinjiang has been the subject of speculation and one of the photographs reproduced here suggests that as many as 10 were handed over to the Kuomintang. I think that was just a staged propaganda image for the benefit of the Japanese and the total probably included the six I-15 aircraft. For some reason East European profile artists and decal manufacturers seem to choose a very light, slightly turquoise blue for the Chinese national insignia of "white sun in clear (or blue) sky". 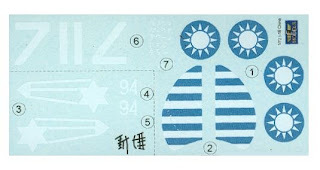 Perhaps it is the description of the symbols, taken from the Kuomintang flag, that influences this choice. Although not defined by Nationalist law the colour was almost always represented in flags and markings as a dark to mid-toned blue with no "sky blue" or turquoise character whatsoever. The 'Album des pavillons nationaux et des marques distinctives' identifies the blue as being Pantone 301c (shown above), whilst Ian K Baker, drawing on the hand-painted colour chips of AVG researcher Terrill Clements, describes it as close to FS *5102, but slightly lighter, when new and reasonably close to *5177 when faded. 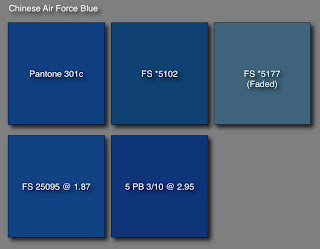 The closest FS value to Pantone 301c is 25095 @ 1.87 and Munsell 5 PB 3/10 at 2.95. All these colours seem a little bright and light to me. I have seen Kuomintang flags and commemoratives with a much darker blue than this, almost like a dark navy blue. There is no doubt that the blue paint faded badly with UV exposure but it tended towards a greyish blue rather than a turquoise or "sky blue". Very few decal sheets seem to get these colours right and a generic sheet of accurately coloured Chinese Air Force stars would be very welcome as there are so many diverse and interesting types of aircraft which they could be applied to. The LF Models decals appear to depict the faded blue but still appear a little "green". It remains to be seen how they look after being applied to a dark green model. Not also from the photograph that there appear to be no upper wing stars although the LF Models decal sheet shows them in those positions. The best published reference I have found for the Chinese I-16 is 'Polikarpov I-16' by Patrick Laureau, Juan Arraez Cerda, Stéphane Soulard and Gilbert Duranthie published in Prague in 2002 (ISBN 80-238-8421-2) which is, I believe, a privately published English edition of the French language book originally published by TMA. However, the profile and information in the book about the Xinjiang I-16 is superceded by this exclusive post at Aviation of Japan. Information about the Xinjiang Aviation Unit is drawn from Xiaoming Zhang's 'Red Wings Over The Yalu', Lennart Andersson's 'A History of Chinese Aviation' and private correspondence. Image credits: Decal sheet cover & decals © 2009 LF Models; Photos private sources; Rendered colour chips © 2009 Straggler. now let's see this in 1/48 , for wich there ARE type 10 kits available. Great job on this, to me previously unknown, subject. Good stuff Nick, thanks a lot!